This kinds of presents boxes are made of high-quality material, it has spherical design, Christmas prints. It can be loaded with candy or other little presents. It&apos;s a perfect and funny gift for children and friends in that special day. 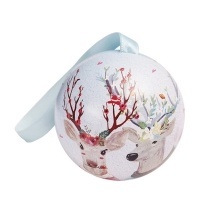 Made of high-quality material, unique spherical design, Christmas prints. It can load with candy or other little presents. Great way to hold and keep your treats and sweets in one place. Five different styles for your choice. Perfect gift for your friends or children. An ideal candy holder for parties and trick or treat in Christmas.